Today is a guest post from my friend Marion. She recently visited an open air exhibit with a difference and shared her pictures with me. It would have been something I would have loved to see in person. However, we are lucky to have technology at our fingertips to make sharing our experiences much easier…so now I’m able to share her pictures with you too. 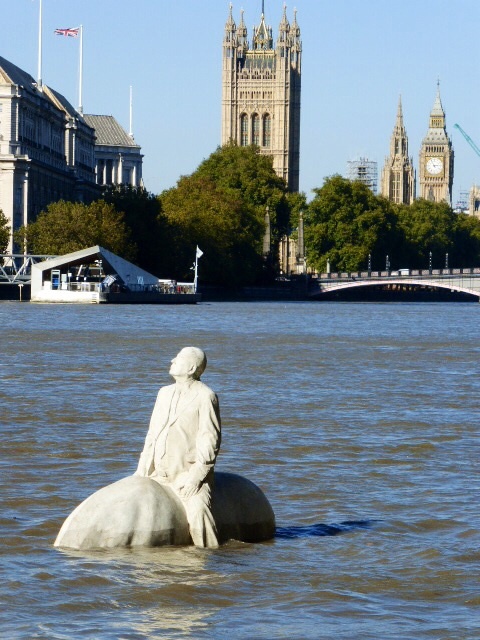 The first London commission of world-renowned underwater sculptor Jason deCaires Taylor, The Rising Tide, is concealed and revealed by the daily ebb and flow of the tide on the Vauxhall foreshore. These four proud horses and their riders highlight the role of the Thames as the lifeblood of London, shaping the city’s great history as an ever evolving centre for culture, industry and commerce. Marion stayed to capture the photos from low to high tide (do you know how long that would have taken?) 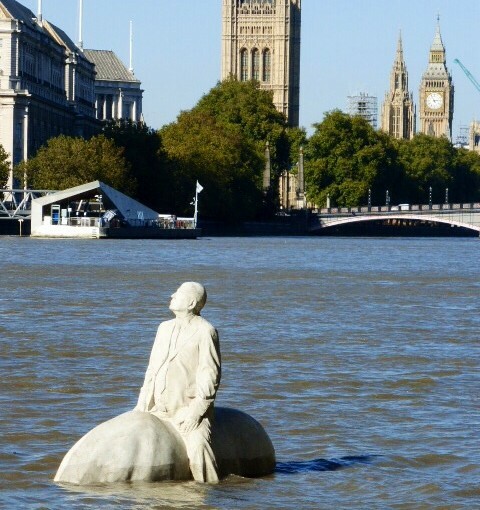 Due to her tenacity and patience we can see how the sculptures are covered by the River Thames over time. 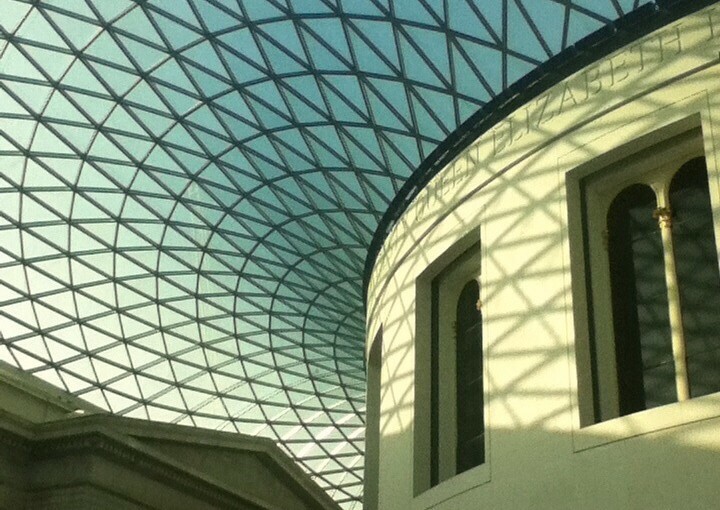 Here’s a picture that was taken inside The British Museum in London. It has an amazing glass ceiling. 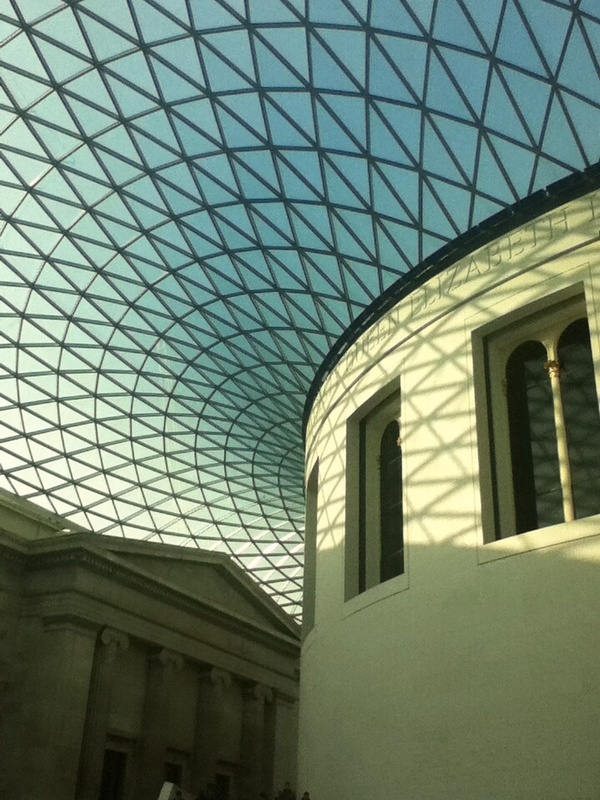 The British Museum in London has an amazing glass ceiling. Designed by Foster and Partners, the Queen Elizabeth II Great Court transformed the Museum’s inner courtyard into the largest covered public square in Europe. It is a two-acre space enclosed by a spectacular glass roof with the world-famous Reading Room at its centre. The courtyard had been a lost space since 1857. The re-design of the Great Court meant that this hidden space could be seen again. The design of the Great Court was loosely based on Foster’s concept for the roof of the Reichstag in Berlin, Germany. A key aspect of the design was that with every step in the Great Court the vista changed and allowed the visitor a new view on their surroundings. Work on the Great Court’s magnificent glass and steel roof began in September 1999. The canopy was designed and installed by computer. It was constructed out of 3,312 panes of glass, no two of which are the same. At two acres, the Great Court increased public space in the Museum by forty per cent, allowing visitors to move freely around the main floor for the first time in 150 years.